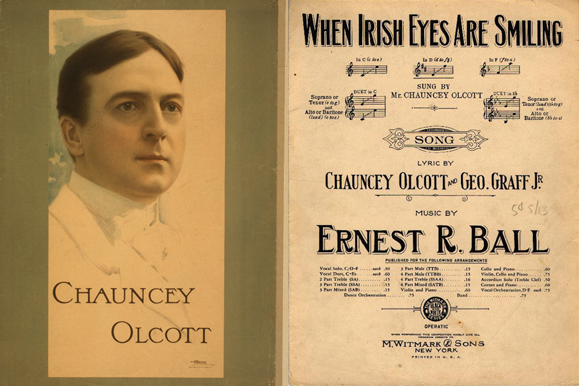 The history of “When Irish Eyes Are Smiling” begins with Chauncey Olcott. Olcott’s mother, Margaret Doyle, was born in Ireland. In the 1840s, when she was eight, her family immigrated to Canada and eventually settled in Lockport, New York. Later, she married Mellon Whitney Olcott and the couple moved to Buffalo where, in 1860, Chauncey (christened Chancellor John Olcott) was born. Soon after, Mellon Olcott died and Margaret married Patrick Brennan, who was chief engineer for the Buffalo Water Works. As a child, Olcott had a gift for song. Often, at the Lockport firehouse, he was lifted onto a table and encouraged to sing Irish ballads. Eventually his performances became more formal. In 1879, at 19, he joined the first in a series of minstrel companies that took him to Chicago, San Francisco, London, and other locales. His good looks, Gaelic personality, and light lyric tenor voice left him much in demand and led to a series of leading roles in plays and light operas. In 1886, Olcott made his New York City debut with the Lillian Russell Opera Company as leading man in a production of Pepita. Thereafter, he starred in HMS Pinafore and The Mikado before returning to London, where he made stage appearances and studied voice from 1890 to 1893. Then, back in the United States, he starred in a series of shows with Irish themes. Among these were Minstrel of Clare (1896); Sweet Inniscarra (1897); A Romance of Athlone (1899), which was highlighted by a ballad Olcott himself wrote entitled “My Wild Irish Rose;” Mavourneen (1900), featuring the song “The Auld Countrie;” Garrett O’Magh (1901); Old Limerick Town (1902); Edmund Burke (1905); Eileen Ashore (1906); O’Neill of Derry (1907); and Barry of Ballymore (1911). The last of these productions showcased the songs “Mother Machree” and “I Love the Name of Mary,” both of which had lyrics written by Olcott with music by Ernest R. Ball. By this time, Olcott’s following among women was so great that Jean Schwartz, a popular composer-singer of the day, wrote a song entitled “Bedelia” which contained the line, “I’ll Be Your Chauncey Olcott.” Meanwhile, the Olcott-Ball partnership was becoming a fruitful one. Thereafter, Ball wrote songs for a Tin Pan Alley company called Witmark Music and appeared on stage as a vaudeville performer. He had a gift for writing heart-warming melodies, and that was what he wrote. He and Olcott collaborated often on music and words, and it was Olcott as a performer who introduced many of Ball’s most popular ballads. “When Irish Eyes Are Smiling” marked the high point of the Olcott-Ball collaboration. Ball wrote the music and Olcott penned the lyrics with George Graff, Jr. The song was published in 1912 and introduced to the public with help from an Ohio socialite named Rida Johnson Young. Young had pursued a career in theater, first as an actress and then as a writer. Starting with a play entitled Brown of Harvard that opened in 1906, she wrote the book and often the musical lyrics for more than 20 Broadway productions. In fact, the current Broadway hit Thoroughly Modern Millie features several of her songs. Isle O’ Dreams closed after 32 performances, but “When Irish Eyes Are Smiling” swept the nation. For several months in 1913, it was the best-selling recording in the United States. Recently, the Recording Industry Association of America cited it as one of the top-selling songs of all time. Olcott enjoyed another number-one hit in 1914, when he recorded “Too Ra-Loo-Ra-Loo-Ral (That’s an Irish Lullaby).” He also starred in Shameen Dhu (1913), Terence (1914), and Once Upon A Time (1918) produced by the legendary George M. Cohan. His last starring role on Broadway was in The Voice of McConnell, which opened on Christmas Day, 1918. Seven years later, he collapsed on stage while appearing in The Rivals, never fully recovered, and never graced a theater production again. Olcott died in 1932. Among the pallbearers at his funeral at St. Patrick’s Cathedral in New York were New York City Mayor James J. Walker and New York Governor Al Smith. Ball had died five years earlier, suffering a fatal heart attack moments after leaving the stage of a vaudeville theatre in California. Olcott was 72 at the time of his death. Ball was 49. This article was published in the December 2017 / January 2018 edition of Irish America. Chauncey Olcott and George M. Cohan are both interred in Woodlawn Cemetery in The Bronx. Very cool story. I grew up in The Rockaway’s, the fifties, and we as kids used to hang out at the numerous bars that glowed during the summers. Some great singers and Irish Eyes was a guaranteed song. Excellent job sharing this.